If the DL9000 is in normal trigger mode and no waveform acquisitions have been made i.e. the scope has not triggered, a query to the instrument using the :Waveform:Record or :History:Record? Minimum it returns a 0 value and not an error. History waveform record number is referenced from 0 however, the instrument did not trigger so if the query command returns a 0 value there is a possibility that the waveform is not 'valid.' Is there a way to determine if the value returned from the query command :History:Record? Minimum is a vali waveform i.e. the instrument triggered and made a waveform acquisition? Yes, to determine whether or not the waveform is 'valid' or not, you will need to determine if the instrument has triggered. You will need to monitor the extended event registered. If no trigger has occurred, then we know that any previous waveforms are 'invalid' because no waveform was acquired. The method for doing this is to monitor Bit 2 of the extended event register. Bit 2 (Awaiting Trigger) is set to logic 1 when the DL9000 is waiting for a trigger to occur. You will need to first set the Transition Filter to monitor Bit 2 to either RISE or FALL. RISE is when the specified bit of the condition register changes from 0 to 1. FALL is when the specified bit of the condition register changes from 1 to 0. The command to set the Transition Filter is for example, :STATUS:FILTER2 FALL, in which case transition filter 1 will detect changes in Bit 2 from 1 (DL9000 waiting for trigger) to 0 (trigger occurred). You will then need to query the status of the extended event register so that when a value is returned, you know the transition filter has detected a change in the specified bit. • :STATUS:FILTER3 FALL – Set transition filter to detect when trigger has occurred. This only has to be set once. • :STATUS:EESR? – Query the status of the condition register. Once a value has been returned then the DL9000 has triggered and the previous waveforms are valid. 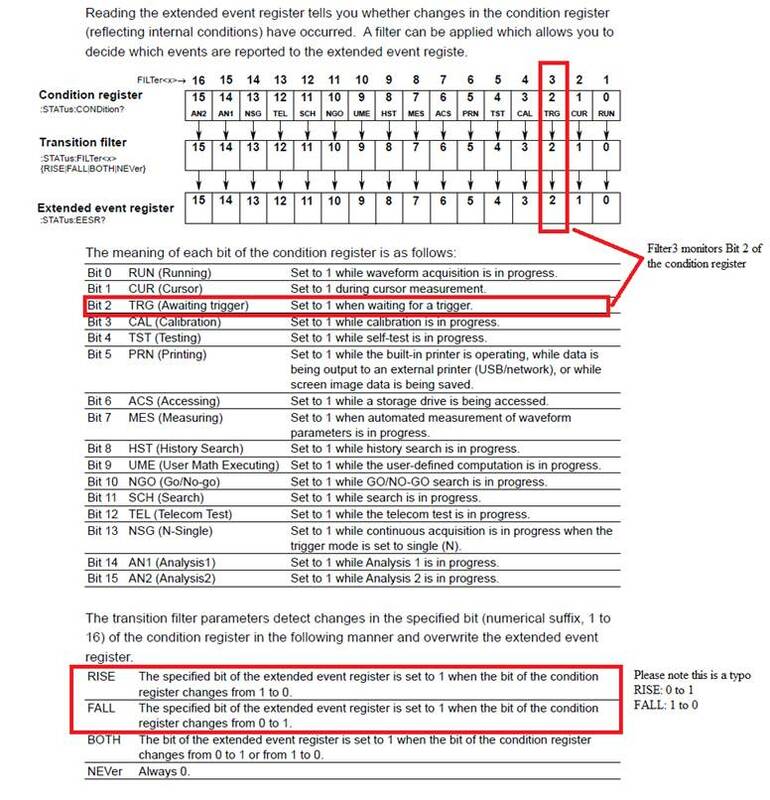 Please refer attached image taken from Page 6-5 of the DL9000 Communications Interface User’s Manual for an example definition of the extended event register. 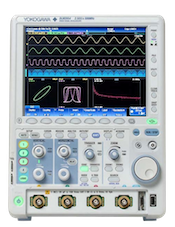 This method is also valid for other Yokogawa DL series oscilloscopes and ScopeCorders, although some commands may differ.